WASHINGTON — In an interview on May 1, White House Chief of Staff John Kelly said that immigrants crossing the border would not assimilate into the U.S., that they don’t integrate well, and that they don’t have skills. “If John Kelly thinks immigrants don’t integrate well and don’t have any skills, then he needs to visit California, where we are a majority minority state and thriving with one of the strongest economies in the world. “John Kelly’s understanding of immigrants in America is inaccurate and it relies on old assumptions. With every new wave of immigrants in our country’s history, xenophobes have used the exact same charge as a weapon to galvanize nativist opposition. And every time, they were proven wrong. That’s the history and reality of the United States – a nation of immigrants. “In every sector, immigrants continue to be a source of strength for our country. But at every turn, the Trump Administration has sought to deny those contributions by falsely painting immigrants as criminals and degenerates. 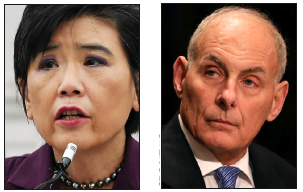 It was only a few months ago that I sat at a table with Mr. Kelly and explained that his ‘chain migration’ slur was not only offensive, it was not factual. I explained how family migration is part of the reason immigrants rely less on government services and own homes in greater numbers than native-born individuals. “The fact is, all he has to do is go into any community in America and he will see Americans from every background and every religion working and living together. Other than indigenous Americans, we are all the children of immigrants. And had the John Kellys of their day triumphed, none of us would be here. We cannot let that change now.